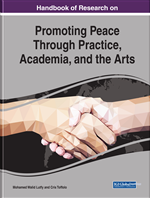 This chapter explains how and why the arts are well suited to address the challenges of peacebuilding. It draws on the example of Grupo Cultural Yuyachkani, a theatre ensemble that accompanied Peru's truth and reconciliation commission, to ground explorations of three bodies of theory: the nature of knowing facilitated through aesthetic engagement; the moral imagination; and the permeable membrane between art and the on-going flow of life. The chapter offers five brief examples of arts-informed peacebuilding in different parts of the world, incorporating different art forms and addressing different issues. The chapter's title is based on the concept of trans-subjectivity, understanding self and other through each other, the ethical and epistemological interdependence that characterizes experiences of coming to know both enemies and poems. Throughout human history, and in every culture, communities have improved their lives through engagement with creative and expressive forms. Cultural productions and the arts, in addition to their decorative and personal expressive purposes, also can be resources for marshaling attention to urgent concerns, addressing conflicts, reconciling former enemies, resisting authoritarian regimes, and imagining and giving substance to a better future. Communities express their deepest values and ethical commitments through aesthetic forms and processes. Humanity dignifies, restores and reimagines itself through creating, performing, interpreting, preserving and revising its cultural and artistic heritage. Works of art both document the inhumanity of war and celebrate the possibilities of peace. This chapter explores theory and practice at the nexus of art, cultural work and peace. It is a vast territory that includes the landscape between the current world, with all its suffering and injustice, and another world, remembered or imagined, where human needs are met more fully, conflict is engaged with less destruction, culture is expressed more joyfully, and stewardship of the planet is embraced. This territory is filled with the vulnerable and full-throated cries of children seeking nourishment, comfort, challenge and opportunity, and resonates with the courageous and steadfast calls of adults who, often against enormous odds, seek to provide for their families and to construct lives of meaning, productivity, responsibility, joy and freedom. In this borderland between suffering and possibility, artists, cultural workers, justice-seekers, and peace-builders create spaces of transformation, where the conflicting, chaotic, and disparate elements of social and political life can be brought into coherent frames to be witnessed and brought into generative relationship. Ethically informed creative action at the boundary between human suffering and human possibility is a central feature of the work and the lives of artist/peace-builders. In fact, the arts and cultural practices are uniquely well suited to meet many of the challenges inherent in building peace. This chapter explores why and how. It is challenging to explore the concept of peace from the perspective of the arts partly because ‘the arts’ encompass many different fields of endeavor, each with its own traditions of practice and related scholarship. Furthermore, a central feature of art-making is precisely that it does not seek to apprehend the world through concepts. Rather, the arts invite us to do just the opposite: to engage with the world through our senses; to see, feel, hear, taste, touch and imagine in ways that are original and fresh, not pre-determined by existing conceptual frameworks or constrained by current discourses. syntax of mutual aid (Levertov, 1987, p. 40). In the sections that follow, we first consider a particular example of an arts-based peace-building initiative, a performance ensemble that contributed to truth and reconciliation in the aftermath of the civil war in Peru. Then, moving from practice to theory, we identify the defining features of art and the distinctive qualities of presence artistic engagement can engender. Next, we explore two related frameworks—the notion of the moral imagination, and the idea of a ‘permeable membrane’ between art and the rest of society—to explain how artworks contribute to peace, as well as distinguishing between peace-building art and other artistic expressions that might exacerbate violence and the conditions that give rise to it. Finally, we look at several examples of arts-based cultural initiatives that address contemporary peace-building challenges. In Peru, in 1980, an armed conflict broke out between Maoist guerrillas and state security forces. It continued for twenty years. The guerillas and security forces entered into “a competition of brutality,” in which more than 69,000 Peruvians were killed, of whom 70 percent were members of rural, Quechua-speaking communities (Febres, 2011, p. 6).